Enjoy The View From Up On Poppy Hill! 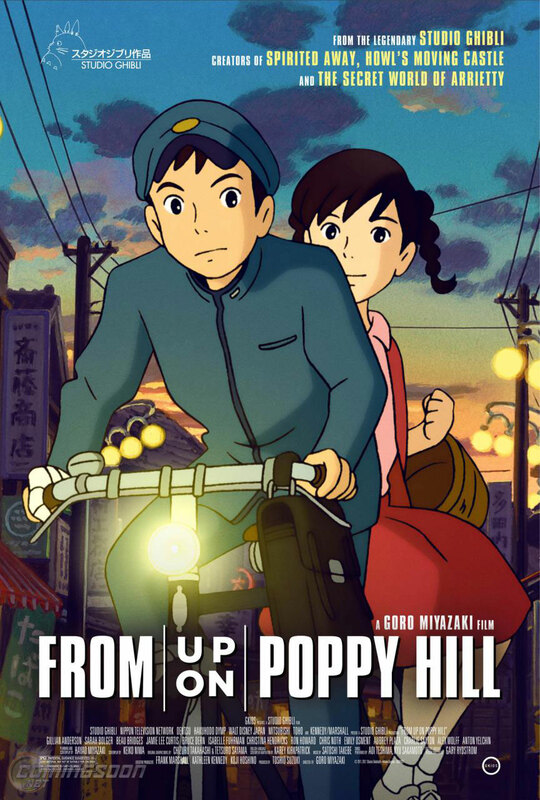 From Up On Poppy Hill is a 2011 Studio Ghibli written by Hayao Miyazaki (Spirited Away) and directed by his son Gorō Miyazaki (Tales from Earthsea). 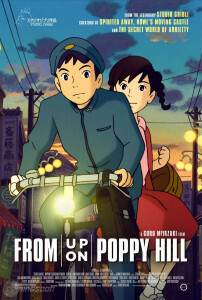 It was distributed in the United States by GKids in early 2013. It is a slice of life movie, so it may not be for everyone, but I quite enjoyed it. The story is about a teenage girl named Umi Matsuzaki who helps her Grandmother run a boarding house while her mother is away studying in the United States. While Umi is at school she runs in to the impulsive Shun Kazama who is trying to save his clubhouse called the Latin Quarter from demolition by people who are trying to update Japan in time for the Olympics. Can they save the clubhouse, and can their relationship survive the trials ahead? The story is slow, but it is nice to see a little of what it was like in post war Japan, and how people lived during that time. The country is trying to surge forward leaving their past behind, but that is leaving some people in its wake. It is not a story that will blow your socks off, but it will try and charm them off. The best part of this movie is by far the animation. The movie looks great. Bright lush colors and beautifully drawn scenery. It is wonderful to look at, and gorgeous in motion. The slow story may not always be engaging, but the art always is. The English voiceover cast does a good job with Sarah Bolger as Umi, and Anton Yelchin as Shun Kazama, and they do their best in this confused teenage romance. Much like any Studio Ghibli film there are a lot of well known actors filling in the supporting roles, and it is always fun to see if you can pick out who they are. This is not Studio Ghibli’s best movie, but it is fun to watch, so for anyone that loves their work it will not let you down. Be charmed by the light story, but fall in love with amazing art. Previous PostPrevious I Made An App For My Phone With The App Studio Beta! Next PostNext Shmee Weeps For Crimson Dragon!